The Brexit brand awareness is universal and massive. Public interest even exceeds the level of media coverage… and still, almost everybody is confused. Most of the world is completely puzzled, as just looking at a map makes it quite clear how European Great Britain is. Brussels sees the aim of the game as ‘Punish England’. The British people have little idea anymore about what it means or stands for. Evidently, Brexit is neither a simple clear brand nor one with an established deep-shared purpose. Given that Brexit is now so central to British life, it seems worth giving it a brand health check. Our ‘Enduring Strategic Brands 13+1 Imperatives’ framework, a system designed to analyse the relative strategic strength of brands, offers a way to explore the state of Brand Brexit. The Imperatives are a set of criteria, including having ‘Clarity of Purpose’, being ‘Rigorous and Disciplined’, ‘Connected’ or ‘Strategy Guiding’, that are essential for successful modern brands. The bad, but probably not surprising, news is that on these 14 measures, Brexit proves exceptionally weak. This is tragic as brands drive behaviours. In the commercial world, people support and buy strongly branded products or services. Who is going to buy Brexit and feel excitement, fulfillment, status and accomplishment from it? Part of the problem is that Brexit is not being managed as a brand. So what if it were? Might we all be looking ahead with more confidence? Let’s use the 13+1 Imperatives framework to explore how those involved might better manage this crucial transformation. Tell me again why we’re doing this? The place to start must be to focus on ‘Clarity of Purpose’ – it’s not a coincidence that it is at the very top of the Strategic Brand Assessment Tool. Interestingly, this is where we can see some recent efforts by the Government to sharpen up Brand Brexit. Mrs. May’s Florence speech on the 22nd September and Boris Johnson’s 10-point plan for Britain’s departure from the EU a week before were actually much more united on tone and language than the press wanted to accept. Both their speeches were peppered with phrases like “We will”; “A bright future”; “A truly global Britain”; “In control”… of “Our destiny”. If “Brexit means Brexit” as the Prime Minister often says, to start with this simple ‘Purpose’, and repeat it again, again and again, serves to remind the public why we are doing this and guide all the implementation decisions. These positive phrases should also help to mitigate the fact that Brexit is so associated with processes, implementation and technical aspects which close to nobody truly understand. This bureaucratic white-out has likely contributed to the prevailing public emotions of sadness and fear. Anchoring Brand Brexit with some positive, forward-looking destination and phrases will help bring the public more on board, whichever way they voted in the Referendum. You then need to rely on a consistent organisational ‘Culture’ to guide rhetoric and actions. Mrs. May used the word “Partnership” 27 times and “Relationship” 19 times in her speech. She refers to “Deep responsibility”, stresses her “Positive belief” and her determination behind “Implementation”. 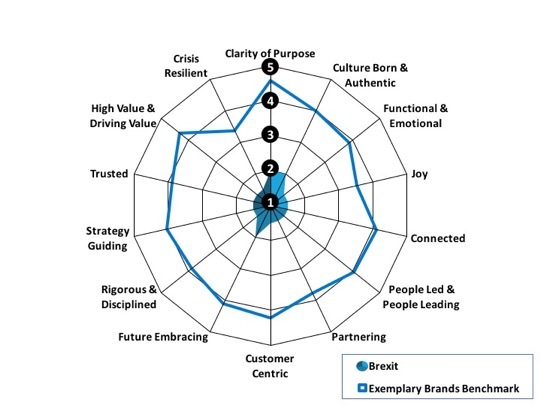 This all seems to be a very effective brand cultural space – let’s hope these values continue to consistently and authentically underpin how Brand Brexit is managed and developed. But there’s far more to do before Brexit begins to resemble anything close to a thriving brand. Probably the most extreme deficit of the Brexit brand– and opportunity nowadays – lies with its relationship with the British public. Expressed in our ‘Enduring Strategic Brand Imperatives’ language, this weakness revolves around the following three questions: how visibly ‘Connected’ is Brexit to people’s daily lives; how much is Brexit ‘People-led’ and relying on strong leadership; and finally, how ‘Stakeholder-centric’ is it? It seems fair to say that very few British people, even among those who voted for it, feel that Brexit is currently serving their interests or has been designed around them. We’re not calling for an equivalent to Donald Trump’s extreme myopic focus on his core electorate and constant tweeting as the solution. But a much more deliberate, systematic and disciplined messaging and communication management effort by the Brexit team within the Government is necessary. The public need to have a much clearer idea how Brexit is going to serve them, whatever the biases of the British press and if only to balance them. They also need to feel that this complex process of separation from Europe is being strongly and clearly led. At the moment, Mrs. May and Mr. Davis are not enough. A diversity of opinion formers and Brexit brand ambassadors would make a huge difference – even beyond the William, Kate, George and Charlotte charm tour in Europe during the summer. Using another of the Imperatives criteria from the framework, Brexit needs ‘Partnering’ as a spirit and a science. Despite fine words from those involved in the discussions, approaching Brexit truly cooperatively currently looks like a remote prospect. Rallying support will also require being immensely ‘Rigorous and Disciplined’ on what each act and word means to the brand, so people become increasingly clear on what Brexit stands for, represents and will translate into once it is implemented. Continuing to examine Brand Brexit via the 13+1 Imperatives of the framework, we see that the lack of brand clarity means that Brexit ‘Strategy’ wavers and appears largely driven by internal little politics. This almost unavoidably results into ever more concessions both to pro-European Conservatives and the EU itself – including the major recent decision to offer a full vote on a final divorce deal with the EU to the British Parliament. Much is at stake given that so few stakeholders have ‘Trust’ in Brexit. A trusted brand would enable the considerable ‘Value’ lying in agreeing on a negotiated Brexit with the EU– rather than going over the cliff edge of a ‘no deal’. This would help with the risk of the payment to the EU drifting more towards £80bn than the £20bn originally offered. It could help restore the pound, which has devalued by 20%, and strengthen economic growth, which has plummeted in the last two quarters. With a strong brand, Brexit would stand a much better chance to overcome the frequent ‘Crisis’ points that are unavoidable in complex negotiations with the EU and the massive transformation of the Nation’s practices needed on 1000’s of different subjects to unwind 43 years of treaties and agreements – such as border control, status of non British citizens, and new trade deals to name a few. I am not naïve to believe that turning Brexit into an ‘Enduring Strategic Brand’ would in itself be enough to resolve the complex issues on substance, internal politics, EU intransigence, immigration, trade agreements, transition, devolution etc. But it would certainly transform the ability to address and resolve these major gaps with more confidence and much greater stakeholder support… as well as bring some ‘Joy’ to a currently sad encounter.